Pond plants provide unmatched ornamental value and welcome refuge for pollinators, birds and a host of other wildlife. They help absorb unwanted nutrients and stabilise sediments, preventing the growth of algae and reducing turbidity. 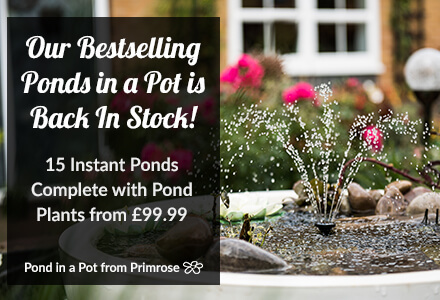 Pond Plants not only provide fantastic ornamental value, but help oxygenate your pond and provide cover for fish. 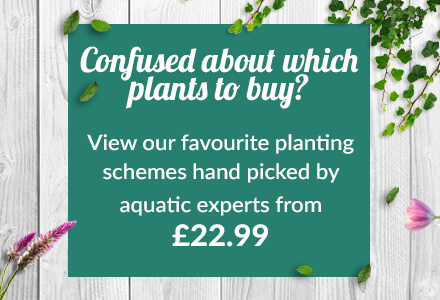 Although irises and lilies are the flowering pond plants par excellence, there are many species that flower such as the forget-me-not and water hawthorn, which both possess interesting blooms. Water lilies are the creme-de-la-creme of pond plants, providing unmatched ornamental value. Around the UK, the most common species you'll see is Nuphar lutea - the yellow water lily - but there are many more varieties in every colour. Gorgeous varieties include Black Princess and Sun Rise. Key to growing water lilies is to keep them away from running water. They also need to be lowered gradually into a pond, so as the pads are not too deep in the water. It is also important to pay attention to the depth and spread of each species as some are unsuitable for deep ponds and others too vigorous for small ponds. Questions regarding oxygenation is one of our most common queries. Although oxygenating plants do help starve algae of nutrients, their effect on aeration is minimal. A good pump or fountain is essential as it helps increase a ponds surface area, increasing the exchange of gases. A still pond without adequate circulation will not exchange gases effectively, leading to a buildup of carbon dioxide and the growth of anaerobic bacteria.